This VIS image is located at the northern end of Gordii Dorsum, where the surface slopes down into southern Amazonis Planitia. Within this image are several different surfaces and textures. At the top left of the image (ignoring the very tip) moving down towards the larger depression there are three different surfaces. There are two small, discontinuous ridges that parallel the depression that divide the three surfaces from each other. At the top the surface is uniformly wave like, in the middle, there is a region of shallow depressions, and in the third region the shallow lineations are more complex and a higher density of features. The lineations are largely parallel and radial to the large depression. The cliff face between the top of the image and the lower right consists of two levels. The upper cliff slopes gently to the edge of the lower cliff face, where the change in elevation is dramatic. Dark slope streaks are visible on the lower cliff face, and on both cliffs on the far right side. The floor of the large depression has a rough surface, with a general linear trend from the bottom right of the image to the uppper left corner. 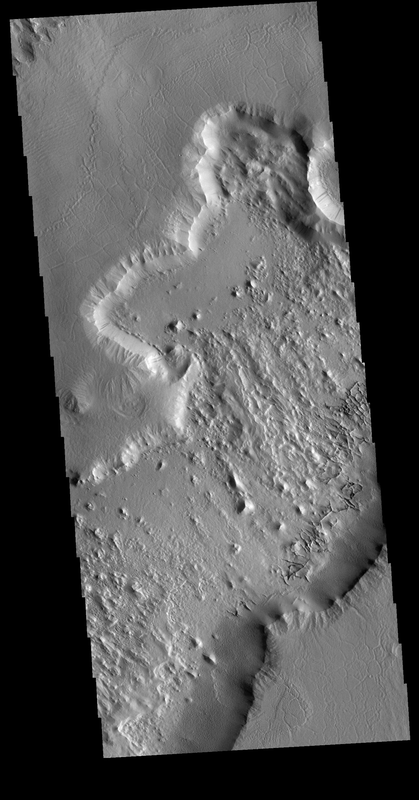 Along the bottom edge of the depression are a series of small intersecting ridges. These features typically represent fracture fill that is more resistant then the surrounding material, which are left as ridges when the surrounding materials are eroded away. At the base of the cliffs at the bottom of the image is a region of uniform texture, probably from erosion of the cliff forming material.